We sat down for a chat with TAG’s superstar artist in residence, Paloma Dawkins. 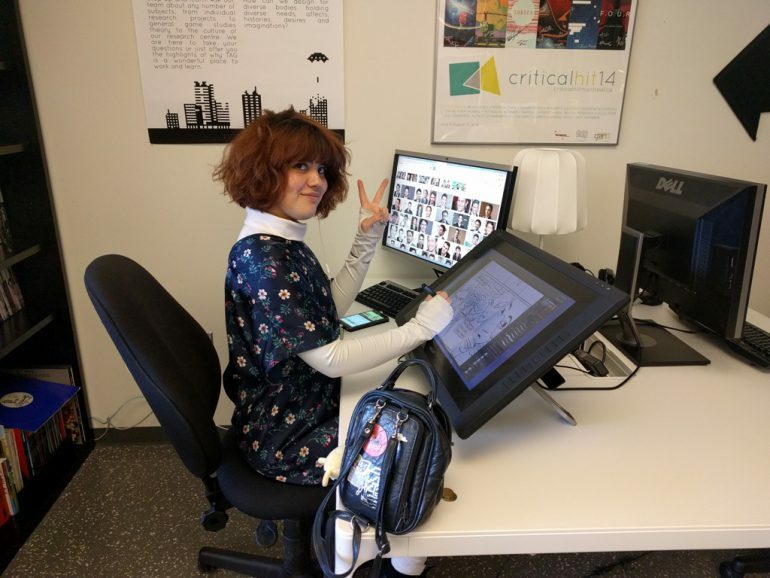 Paloma is a game designer, animator, and author of multiple graphic novels. She has done work for the likes of the National Film Board, Epic Meal-Time, and Deadmau5. This year, she’s been working on a new creation, Museum of Symmetry. Here’s what she had to say. I’m working on a game right now called The Museum of Symmetry. It’s about a young girl that goes on an internship – she’s been accepted for an internship, and so she’s going on a quest to find the museum where the internship is. The directions she gets are really cryptic. It’s all kind of just like a really visual adventure/storytelling game. And there’s not a lot of mechanics at this time. It’s more exploration and visuals and writing. Q. What’s the interface like? How are you presenting it? It’s going be a PC game. I’ve been kind of thinking about how to represent the game, as in, is it a side scroller? Is it a first-person-whatever? And one of the main parts of the game is that the perspective actually changes constantly. Which is a challenge when it comes to controls. But, it’s one of our main goals in the game is to make that easy and flowing. Q. So you’re working with somebody else? Yeah I’m working with a programmer named Osman Zeki and he worked with the NFB before on a VR experience, and he’s very very great. I’m also working with a writer named Ashley Opheim. Her artist name is Ashley Obscura. She’s this extremely talented poet and she writes these really beautiful lines. So the characters are saying these really poetic, sweet things. We kind of work on our own. We meet up once a week to talk over stuff, but I think we mostly work alone. Q. Do you have an idea of an aesthetic you’re going for? Yeah, I have a pretty specific aesthetic. It’s mostly my personal… just cartoony, very psychedelic and cartoony, and fun to see, and sweet and kinda cute. Q. Have you chosen a tool that you’re going to use? I’m making it in Unity 3D. Q. What’s been the most difficult/challenging thing, working on these games? I guess it’s different way of thinking. I’m more used to sort of different scenes. I’ve been making art in a video/VJ kind of scene for a while, and so it was just different, the way that developers make games and how they treat money and stuff like that. It’s more important or something. I feel like in some areas of art, money’s just not important. Q. So it seems more product/business oriented? Q. Are you planning to sell your game? Yeah, I’ve been selling my game and it’s been going pretty good. But it’s different: a different way to think. Q. What stage is Museum of Symmetry at? It’s still in its writing stages. I’m still designing all the things. It’s in concept/pre-production basically, but it’s going really well. Q. How long do you think it will take? How long it will take? Oh, I hope a year. Less than a year, hopefully. I mean I’m pretty sure I could do it in less than a year. I’ve just got to not get too excited! [laughs] Which is hard to do. Q. How’s it been, being here at TAG? It’s been awesome. I just love all the cool things that are happening. The soldering, and the 3D printer, and being surrounded by all this cool stuff. It’s really inspiring. Q. Do you have any advice for students who want to do, or who are doing, what you do? I guess my advice would be […] don’t be afraid to mix things. Try to notice whenever someone tells you that there’s something that you can’t do in a game. Because usually when someone tells you that you can’t do something, it’s actually something that you should do. Or you could do. You just have to find a way to go beyond that, and don’t get caught up in the idea of “something that you can’t do in games,” because that’s just the old way to make games, which is very repetitive. Also, do tutorials. Just try things. Stay tuned for Part 2 of Paloma’s interview, coming next week, in which she talks Game Developers Conference, graphic novels, and making game sequels.